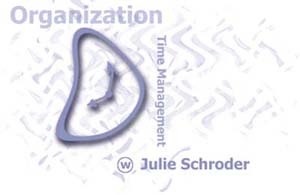 "Manage Your Mess -- Julie Schroder, Professional Organizer and Time Management Consultant"
Feeling too Stressed? Is there never enough time in the day to get things done? I have the solution for you. home or the workplace, your life seems chaotic and full of stress. I can help bring peace to the chaos and freedom from the stress. Let me help you get organized. It's amazing how fast the market is changing. New Organizational tools are available everyday. the folder at the left.. Schedule a seminar for your company. Or contact me for a schedule of seminars being held this year. do yourself with my Before and After photos. Do you have a question about Organization or Time Management? Send it to me. Just click on the excited fellow above.